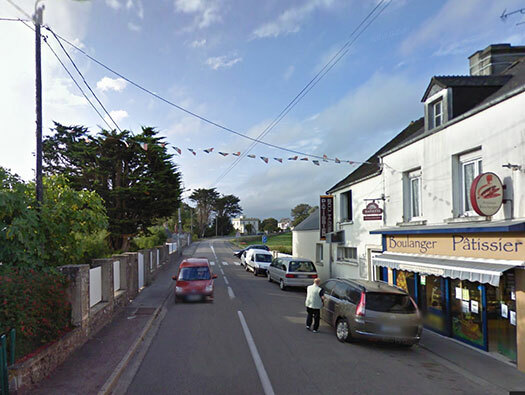 StP18 Quineville le Bours Neuf le Havre, K.V.U.Gruppe St Vaast, K.V.Gruppe Cotentin Ost. 1 x R668 Kleinunterstan für 6 Mann. 1 x R667 5cm KwK bunker. 1 x R656 15 man bunker. Pz.T. S35 4.7cm KwK173(f) turret. 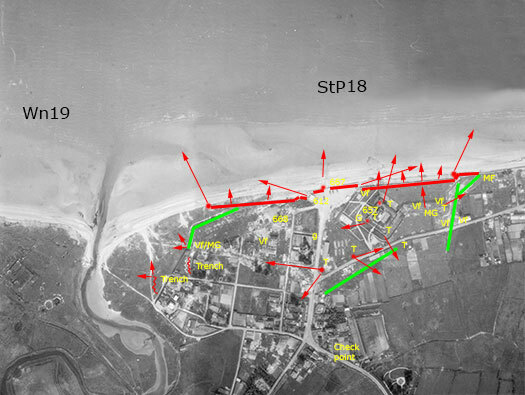 This is an Allied Bigot map and a plan of all the defences in the area dated April 1944 and the hash areas off the beach are the 'Area Odysseus' Wn19Â & 'Area Odol' StP18 part of the German fire plan for inland guns to fire onto the beaches in the event of a landing. 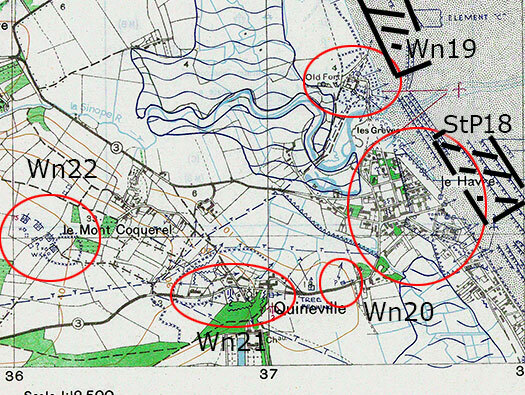 the guns of Wn22 Mont Coquerel would have drenched this area in kneaded. R668 Kleinunterstan für 6 Mann. 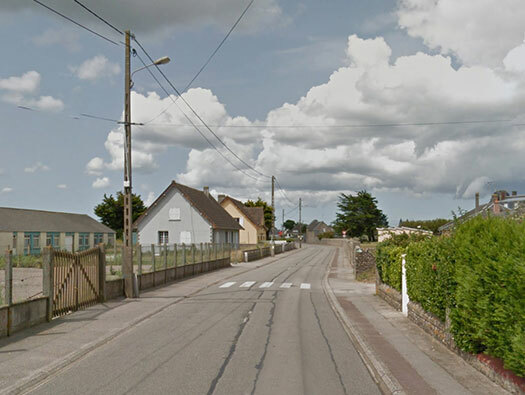 I am starting at the road into Quineville le Havre from Quineville and here on the right was a road checkpoint, possibly a machine gun pointing up the road and a barrier across the road. 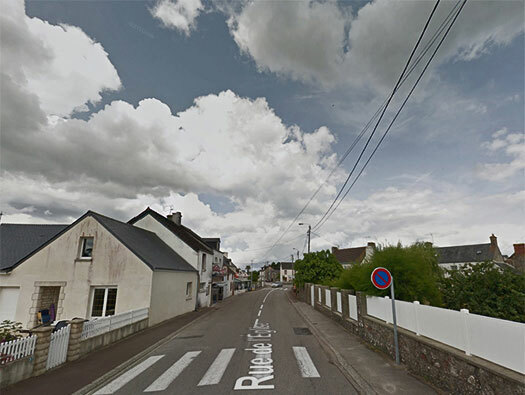 Here on the left was a road checkpoint, possibly a machine gun pointing up the road and a barrier across the road. Red lines - Ant-tank wall. Green lines - anti tank ditches. Arrows- are the different gun positions. This is the edge of StP18 where something like Belgian gates were linked together to make an ant-tank barrier down to the Sinope river. A row of Belgian gates linked together. The wall was a natural defence to the north and the Ankerblock für Sperre can be seen further along. The perfectly round stone in the wall I have no idea what it may have been used for. The anti-tank sea wall southern end. S35 Tobruk as it was. 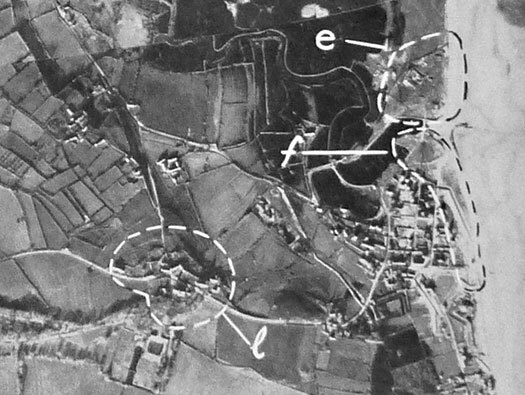 Allied plan of this bunker. 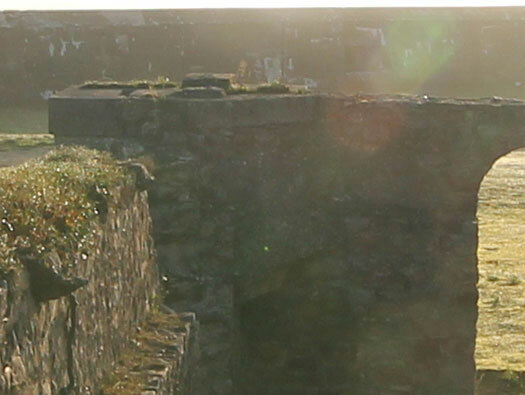 There are several close combat defence embrasures set into the wall where a machine gun could fire through. 442P01 seems to be the type used. 442P01 Close combat defence embrasure. This is where an MG scharte has had the top cut out to allow campers to walk to the beach. Plan of the anti-tank wall. 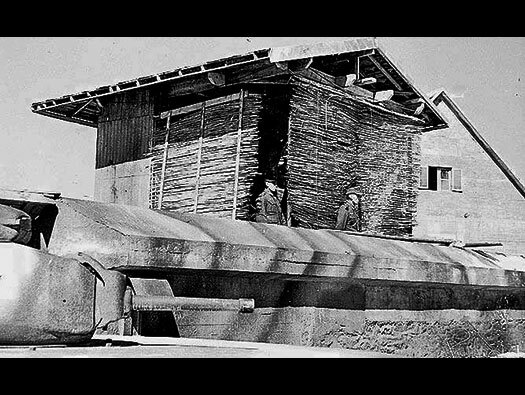 R612 with a flanking wall protecting the embrasure from direct fire from the sea. Still has some remains of its camouflage on the top of the flanking wall. remains of its camouflage on the top of the flanking wall. This picture shows the added tiled roof as camouflage to make it look like a house and an extra wall has been added to the flanking wall. Windows painted on the wall and wooden shutters to close off the embrasure. Field gun inside the bunker. Rear entrance with the tiles now removed from the roof to probably tile the roof they were stollen from. It loooks like a wooden not armoured rear door. 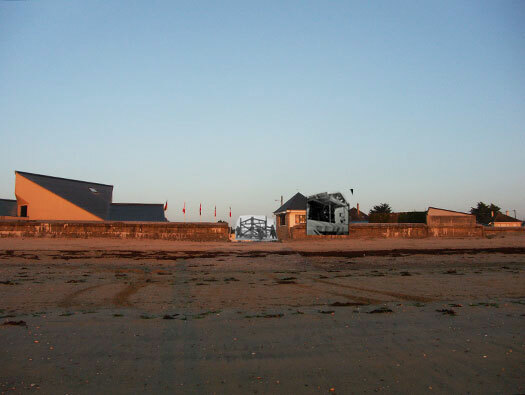 This picture of the rear is inside the R667 (now a museum) that was to have fired south down the beach. The rear of the casemate today. The view along the inside of the anti-tank wall. 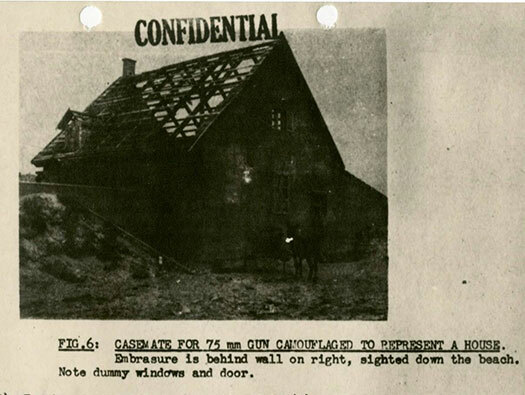 From an allied intelligence document. The view from the other-side of the Sinope River looking south. StP18 Quineville le Bours Neuf le Havre. This is where the search light would have sat where the Office of Tourism is today and down to my left another S35 turret. The search light and S35 turret. One hell of a sunrise. I have superimposed the search light and a Belgian gate covering the beach exit. 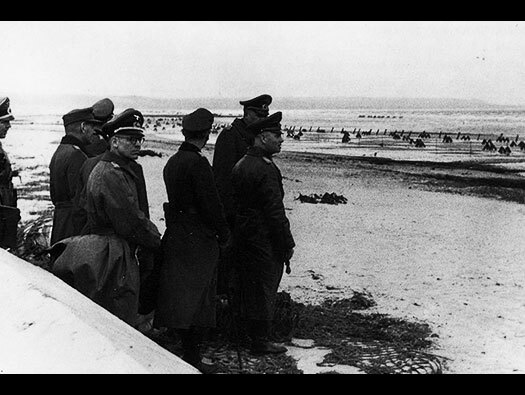 Quineville beach with Rommel on one of his many visits to the beaches all along the Atlantikwall. I expect he said ''Put more mines in''. The concrete on the feet held the Czech Hedgehogs down better. The view into Quineville le Havre from the beach. And a then and now picture from an Allied Intelligence Report. The truck was their personnel transport. They went around France in 1945 photographing the beaches, just in case the British Army had to re land in France in a future war. Continuing along the tank wall south. R667 casemate for a 5cm KwK L/60. Interesting, the books state an L/42 which did not have a muzzle break but a contemporary photo of the gun shows it to be an L/60 with the muzzle break?? The contemporary picture showing a muzzle break. 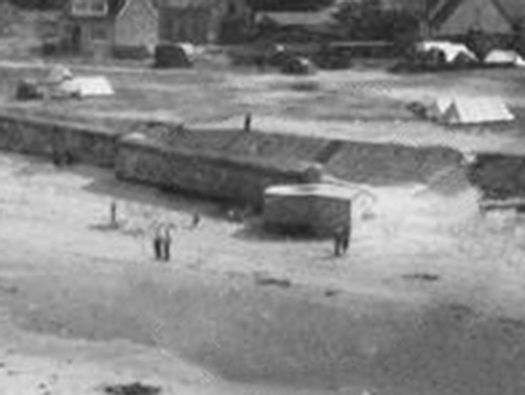 On the left is the R667 casemate and the gap in the tank wall is where an MG Scharte was and opened up for holiday makers to walk around. This shows the gun with a muzzle break and an L/60. Inside showing from L to R, bullet splatter marks on the back wall. The niche where fired shell cases can be placed to go outside the gun room and keep it clear. The door and ammunition space slot in the wall. R667 and on the left an MG Scharte. The new sea wall with the tank wall behind. MG Scharte at the front. R35 Tobruk as it is and was. R35 Tobruk as it was. Pz.T. R35 3.7cm KwK144(f). Where the turret fitted on. This is the view the gun would have had out to see. The ring of bolts would have held down the geared turret ring and the turret sat on the top. The turret then could be cranked around by a small gear wheel to aim the gun at its target and another to aim up and down. The far end of the Anti-tank wall. Walking down this alley we found a plaque on the wall. En ce lieu le 28 juin 1944 Arturo Fanconi citoyen suisse a donne sa vie en sauvant ses comerades lors des combats de la LIBERATION. 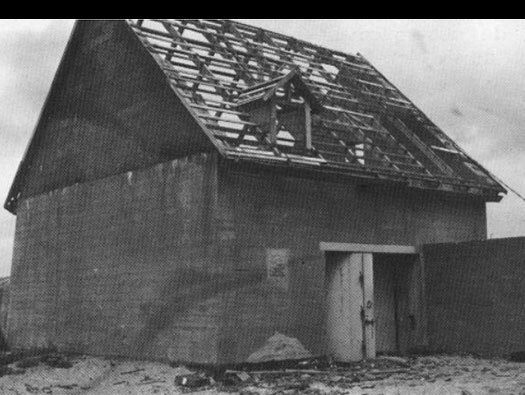 In this place 28 June 1944 Arturo Fanconi Swiss citizen has given his life saving his comerades during the fighting in the LIBERATION. Plaque in memory of Arturo Fanconi, a Swiss citizen volunteer in the US Army. He was killed by a mine explosion June 28, 1944, rescuing his wounded comrades. US 4th Div. moving inland. StP18 Quineville le Bours Neuf le Havre Pz.T. R35 3.7cm KwK144(f) somewhere here. The road coming up from the south where another R35 tank turret was situated. StP18 Quineville le Bours Neuf le Havre Pz.T. R35 3.7cm KwK144(f). This one in the flower bed. StP18 Quineville le Bours Neuf le Havre. Pz.T. R35 3.7cm KwK144(f). The view up the road south. This one (now removed) would have been able to cover 360deg. inside the StP18. A small Vf strengthened position just inside the main gate. A small Vf strengthened position just inside the main gate. The last use was a wine cellar. The two bunker entrances and four air vents. To the left the is (bricked up) is the entrance to the attached Tobruk . And between the two doors the crest of he unit stationed here. R656 15 man bunker plan. How it is situated on the side wall of the bunker. Gas lock with two 434P01 splits armoured doors.. The single inner door would have been a steel 19P07 with a gas seal all the way around it and a small glass window to look through. Crew room for 15 men. Plan of a bunker bed. Crew room with lots of fittings on the walls. Layout of bunks fitted to the wall of a bunker. The two close combat defences covering the entrance passage (gas lock). Close combat machine gun mounting. Anti gas spare filter storage fittings. Gas filters stored just off the floor. Anti gas filtration for a bunker. The R565 bunker with the Tobruk on its left. The view down to another small entrance and the earth bas been removed from the walls. In the corner is a Tobruk defence. The roof of the R565 bunker with the four aerial tubes and some still have the original steel screw on covers. Tobruk in the other corner. The third Tobruk defence of the Quineville Nord (batterie) (French). The more modern and grand entrance to the old battery. The 3rd Batt. 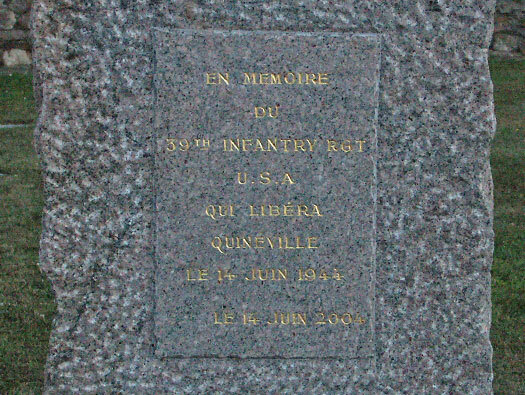 39th Inf. were moving up the coast, the 3Batt. 22nd Inf advanced along Quineville Ridge moving east. 36 A-20 bombers went in and bombed the town prior to the advance. K comp. 39Inf managed to enter the town but came under some bitter opposition from the defenders of the beach. Tanks could not advance due to heavy mortar fire. Smoke was sent in onto the town and K Comp. advanced. With that the defenders realised things were hopeless and surrendered. The 1st Batt. 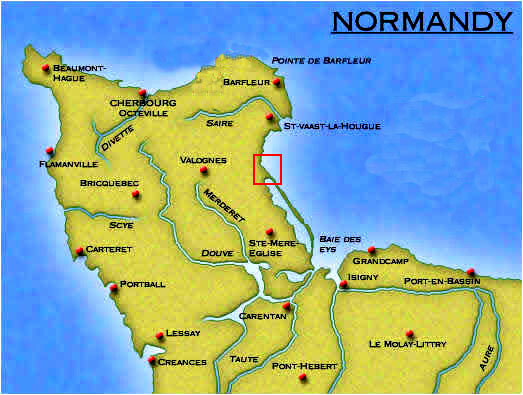 39Inf working north managed to take Fort St Marcouf but lost several men to mines. A 20 with invasion stripes. Blue the Americans and Red the defence.